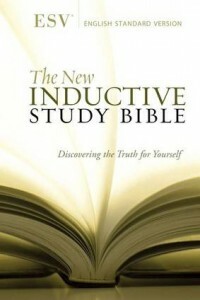 ESV Inductive Study Bible… GET ONE! What do you get when you blend the best contemporary English translation of the Bible with the genius of Kay Arthur‘s enhanced Inductive Bible study method? That’s right! 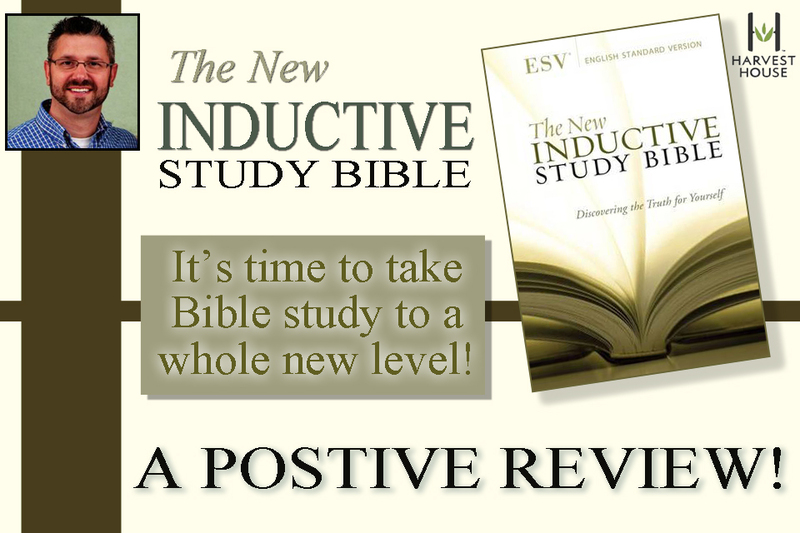 You get what you’ve always wanted for Christmas… the new-and-improved ESV Inductive Study Bible (ISB). Thanks to Aaron Dillon at Harvest House for passing on the hard-cover version for review. Without hesitation, I can say that when I learned how to do inductive Bible study, my relationship with God, and my love for the Bible began to radically change. One of the tools I have used regularly over the years is the first copy of the International Inductive Study Bible that I bought twenty years ago. In fact, my wife and I each had our own copy, and they got a lot of mileage! Step One. The starting place in the inductive method is OBSERVATION. If you like marking up your Bible, the inductive method will take you to a whole new level, and the ISB has lots of room for you to mark things up! There’s a guide for this important step included at the front of the Bible (pp. 15-26) that covers the observation process, including (1) asking questions, (2) marking key words and phrases, (3) looking for lists, (4) making grammatical observations, (5) looking for big themes, and (6) making analytical charts. You’ll learn to locate key words, phrases, ideas, and concepts, and color-code them with symbols or special markings in order to trace themes throughout the text. Grammatical, composition, and structural observations help make sense of the flow of the text. Just learning to be a good observer when studying the Bible makes all the difference, and the ISB’s short-course on how to do it will change the way you study the Bible forever! Step Two. The second step in Inductive Bible Study is INTERPRETATION. This is where many aspiring students of scripture get into trouble. Pages 27-28 provide five important things to remember when interpreting scripture: (1) Context rules, (2) Be sure your conclusions line up with the rest of Scripture, (3) The bible doesn’t contradict itself, (4) An obscure passage should not be the basis for rigid theological conclusions, and (5) Look for the primary meaning in the text. There is obviously a lot more to biblical interpretation than this, but these five ideas are important, and the ISB has tons of helpful tools to help the student of the Bible work hard at careful interpretation. Step Three. The final step in the inductive method is APPLICATION. Pages 29-30 contain helpful insights for biblical application using the outline in 2 Tim. 3:16,17. The student of the Bible is to be open to God’s teaching, reproof, and correction. Studying scripture should lead to life-change, and the ISB is laced with helpful reminders to apply what is learned. When I learned inductive Bible study twenty years ago, I approached the three steps outlined in the ISB by asking myself three questions each time I sat down to study the Bible: (1) What does it say? (Observation), (2) What does it mean? (Interpretation), and (3) What should I do now? (Application). Like I said, if you study the Bible using the ISB, your love for the Bible will grow, and your life will change. In The Front: The new version of the ISB contains a ton of amazing and helpful tools. Before the Old Testament, there is a small section of Bible background material called “The Spiritual Life of Israel,” which includes beautiful colored maps of the Old Testament Tabernacle, Solomon’s Temple, Herod’s Temple, the Temple Mount during the second-temple period, and the entire history of Israel. Book by Book: Each book of the Bible in the ISB contains a section called “Things to do” which help the student to set out in a carful and orderly way when working through the steps of inductive study. Each book has a basic outline of how to study each section, and a section called “things to think about” which will aid in the interpretive process. Three of the most helpful tools in the ISB are the spaces provided for the student to write his/her own Chapter Theme, tons of room in the margins for notes and insights, and an analytical chart at the end of each book to help you chart your own outline. Most study bibles do this for you, but the passion of those who created the ISB is to help you learn to do this yourself. Interspersed Goodies: There is a wealth of study material interspersed throughout the ISB. Each book has tables, charts, historical data, calendars, tables for weights and measures, biographical analyses, maps, diagrams, time-tables, and innumerable illustrations to help you jump down into the text and learn what’s there. Treasures at the back. The section of resources at the back of the ISB are incredible. Titled Bible Study Helps, this section contains information on how the Bible came to be, an overview of the entire biblical history from creation through the early-church period, and even some information on world history through the church age. There is an entire section of information on how to interpret various genres of biblical literature, a ton of grammatical helps, information about symbols, figures of speech, metaphors, nuanced language, and a great section highlighting various aspects of Greek grammar (the language of the New Testament). Bible study plans, harmony of the Gospels, historical charts and maps, and a pretty solid concordance, along with several blank pages for you to take your own notes can all be found at the back of the ISB. THIRD – Why this Bible? A final word of encouragement about the ISB is in order. This is a Bible that literally invites engagement in the Word of God. It invites you to interact with it — to break out your pencils, crayons, notebooks, and study tools. It invites you to chart your insights, journal your findings, and live out the convictions that you learn as you study. It is a Bible that you will go back to over and over again as you mine out new insights, or look for that outline you put together when someone has questions about the meaning of a text. This Bible will become your friend, and will keep you company for years as you learn to engage it, study it, and live it. I encourage everyone to have their own copy of the International Inductive Study Bible, published by Harvest House… and of course, be sure you get the ESV. It is, in my opinion, the best English translation in a long time. Order it here. There’s plenty of time to get this (or to put it on your wish list) before Christmas! And, finally – feel free to engage me in the comment section below. I’d love to hear from you.